What’s your favorite season and why? Do you like the cool breezes of spring or the smell of dried leaves in the fall? Or maybe you excitedly await the return of peonies in the summer and pine wreaths in the winter? 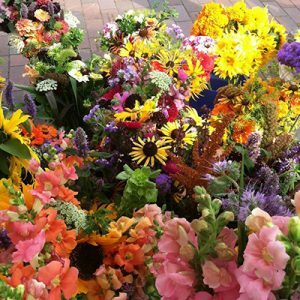 Just like local food, locally grown flowers are a perfect reflection of the seasons they bloom in. Light, bright, and airy tulips in April, vibrant dahlias in the summer, and hearty fall colored chrysanthemums as the weather turns. Flowers can be another way to enjoy and celebrate the unique gifts the Pacific Northwest offers. They are also an important way one can reduce their environmental impact. Conventional flowers are often grown half way around the world in places like South America and Africa. Opting for local flowers from farms that are actively practicing sustainable agriculture techniques means cutting way down on travel miles, energy used for hot houses, and all the chemical inputs it can take to grow these delicate beauties. Thankfully we have a number of sustainable flower farms right in our own backyard. One we’d like you to meet is Foothills Flowers. They’ve been growing everything from zinnias to sunflowers for the past three years in Whatcom County. Run by Sadie Beauregard and Paul D’Agnolo, they are a part of Cloud Mountain’s Farm Incubator and are 100% dedicated to environmentally conscious farming. On their way to organic certification, they don’t use pesticides or herbicides, and they are actively working on restoring soil health. They both say they can see a difference, and the positive impact this has. 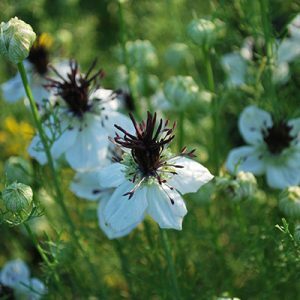 Last summer, for the entire time the Sweet William was blooming – a small beautiful disc-shaped flower that grows in bunches – beneficial pollinators covered the plant. Think hundreds of swallowtail butterflies, honey bees and more. Their small biodiverse farm is an oasis for beneficial insects, an important link in our local ecosystem. Paul and Sadie have a wild love for flower farming and each other – they were married last year at Fort Warden, their first date spot and (of course) with flowers they grew. Both have a rich history, with years of farming experience and a handful of other interesting careers behind them. 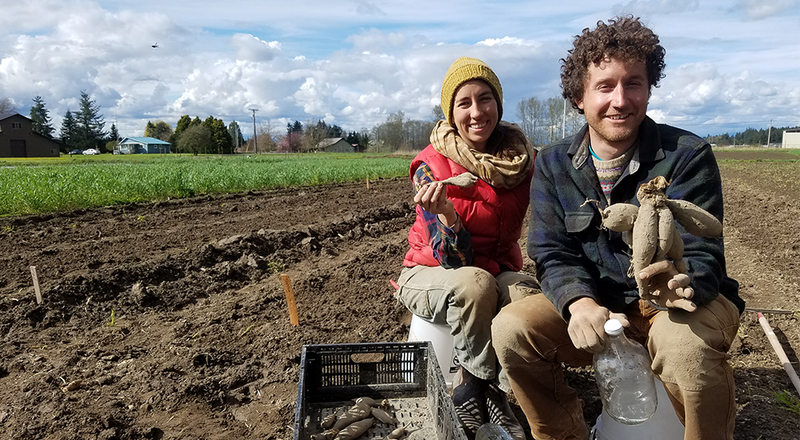 Sadie, originally from Vashon Island, has worked to address food access issues in her home state, with the Seattle P-Patch Program’s urban fruit harvest project, and on a number of farms in Kitsap County. Paul grew up in Minnesota, picking up rocks behind tillers with other farmers kids in vast monocultures of corn or soy. He saw fields of harvest-ready corn being tilled back into the earth because of complex subsidy issues and always thought there was no way he would be farming as an adult. Though he is now a farmer, he is most definitely a different kind. Before farming, he worked in conservation up and down the West coast, helped Seattle Tilth, and even ran a garden-consultations-by-bike service. Both Paul and Sadie think of flowers like they think of food, where they come from matters. Your entire table can be a shrine, a way to celebrate what nourishes you and the world – and the vase of flowers in the center is no exception. 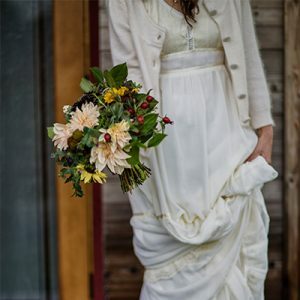 You can find Foothills Flowers at the Anacortes Farmers Market or you can purchase bulk flowers directly from them – they’re a wonderful pick for weddings and have made many Whatcom brides exceedingly happy. They also grow dye products and have their own hand-dyed yarn for sale. Contact them for more info! Foothills Flowers and the Dahlia from Sustainable Connections on Vimeo.